There are some great places for whale watching Sydney. Humpback whales can be seen along the coast off Sydney between April and December. Between April and August the head north, and between August and December they head south. On their way north they are swimming closer to the shore and are easier to see from the coast, while when heading south, they swim farter away - except when mothers with calves arrive in Mid-October, they swim slowly and close to the shore. 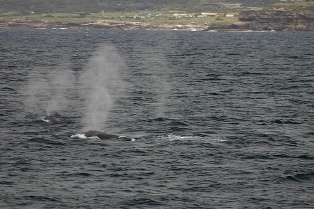 Other whales that can be seen around Sydney are Southern Right Whales; and Sperm, Pilot, killer and Minke Whales, and Common and Bottlenose Dolphins. Good places to watch whales from the shore are North and South Head; Bondi (Ben Buckler), Maroubra (Magic Point), La Perouse (Cape Banks), and Botany Bay National Park (Cape Solander). There are daily commercial whale watching tours running from a few wharfs in Sydney Harbour, including Circular Quay and Darling Harbour. They will take you out to the ocean to see the whales.